Looking for a hotel near Millennium Park Chicago? With more than 60 properties within a radius of 1 mile, you are gonna be spoilt for choice when looking for a hotel in downtown Chicago. 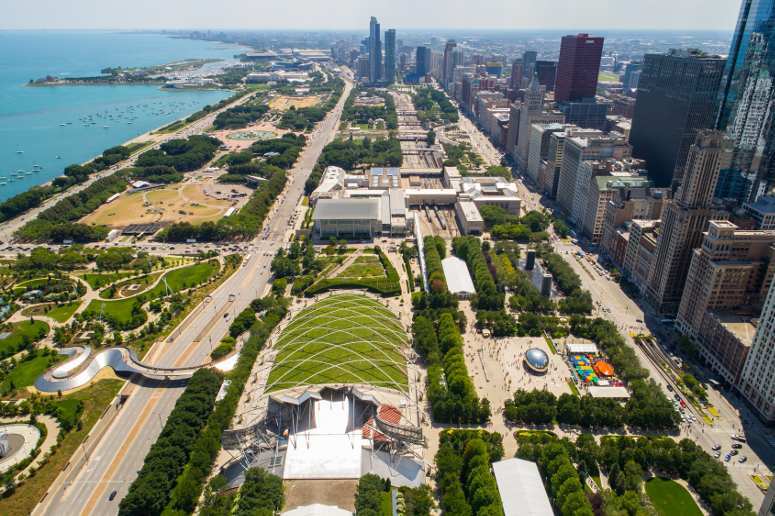 Millennium Park is indeed one of the top attractions of Chicago, appreciated by locals and visitors alike. Finding a hotel room near the park is very easy, considering the large number of properties concentrated in the area. For you, we have ranked the 6 best hotels near Millennium Park. Explore our options and choose the one that best suits your needs and tastes. 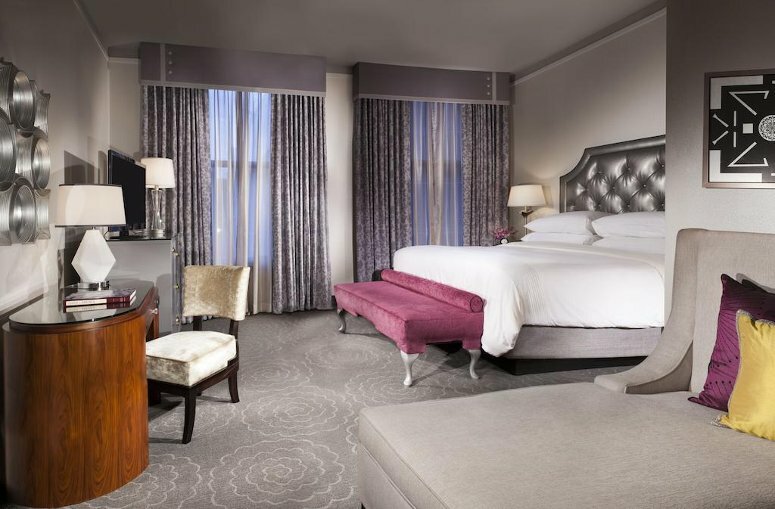 Located in the Loop, The Alise Chicago, formerly Hotel Burnham, is your perfect destination for a memorable stay in downtown Chicago. Nestled just steps away from Millennium Park (only a 5-minute walk) and the Theater District, the hotel is housed in a National Historic Landmark, the Reliance Building, one of the world’s first skyscraper dating back to 1895, and maintains some original details, such as terrazzo floors, mosaic tiles, Italian marble columns and the like. Rooms are simple and quite small, but still very tasteful and elegant, equipped with all the modern comforts you can think of: mini fridges, high-speed wi-fi (at a fee) and high definition TVs. Beds are absolutely plush, with extra-luxury duvets, sheets and pillows (they call it the Naked Experience, as the only thing you have to do is get naked and enjoy the warmth and softness). There are also some rooms accessible for guests with disabilities. You can start your day with an energizing breakfast at the hotel’s bar and restaurant Atwood: open for lunch and dinner too, this restaurant is known for using local, seasonal ingredients for their meals. If you travel with your dog, you’ll be happy to know that pets are more than welcome at the Alise Chicago. If you have a car, only valet parking is available at a fee. If you want to do some exercise, you can access the hotel’s fitness center. The hotel also offers complimentary bike for guests to borrow. One of the city’s most peculiar boutique hotels, only 8 minutes’ walking from Millennium Park, Chicago Athletic Association is housed in a restored Venetian Gothic building, a tower built back in 1893 for the World’s Columbian Exposition. Originally it was an elegant men’s club: more than a century ago, it served as home base of the Chicago Athletic Association. The building was then turned into a modern boutique hotel that still retains a masculine sport-related touch, as evidenced by lots of athletic memorabilia, giant stone fireplaces or the so-called Game Room, originally the billiards room of the club, now an elegant bar and playground serving up classic cocktails, top-quality beers and great food. Modern amenities like free wi-fi and oversize televisions are not missing. Rooms at Chicago Athletic Association are appreciated for their vintage style that includes details from the building’s athletic past, such as nightstands’ legs done up in tennis racquet wrap and storage walls made from old gym ladders. Dining options at Chicago Athletic Association include Cindy’s, the hotel’s rooftop restaurant, which also functions as a bar and a terrace overlooking the surroundings, the Milk Room, a bar that serves coffee until 2.30 pm and sublime cocktails at night, the afore-mentioned Game Room and 2 more places to eat and drink: the Shake Shack, on the ground floor, appreciated for burgers and shakes, and the Cherry Circle Room, on the hotel’s second floor. On the same floor, you will find the Drawing Room, basically the hotel’s reception, with its elegant leather couches and its 3 fireplaces, ideal for a working breakfast or an aperitif before dinner. 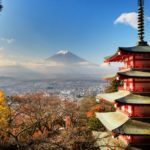 The hotel also has a large and well-equipped fitness room, a valet parking, a 24-hour in-room dining service and some of the rooms are suitable for pets. Booking a room at the Hyatt Centric Hotel in the Chicago Loop, you will find yourself right in the middle of the action, within walking distance of the main city’s attractions, Millennium Park included (it takes only 8 minutes to get there on foot). The hotel is located in an art-deco 22-story building dating back to 1927, but inside the rooms and common spaces underwent a modern upgrade to offer guests the highest standard of comfort. Wi-fi is free throughout the hotel. Dining options at the Hyatt Centric the Loop Chicago include a French restaurant, the Cochon Volant, and a sophisticated rooftop bar, the AIRE, serving unique cocktails, noble wines and great beer along with small plates ideal for sharing: it goes without saying that the view from there is amazing. The hotel features a 24/7 fitness center and 6 event spaces, all equipped with high-tech features, perfect for conferences and business meetings or weddings and other private celebrations. There is an on-site valet parking available for a fee. Last, but not least, no need to leave Fido at home: the Hyatt Centric the Loop Chicago accepts pets provided that they do not weigh more than 50 pounds (there is a fee though). Some of the exciting things you can do in Chicago while staying at Hyatt Centric include a trip to River North, a visit to Garfield Park or a visit to Chinatown. Originally an art-deco bank building turned into a trendy boutique hotel thanks to Sir Richard Branson, right in the heart of Chicago, only 12 minutes walking from Millennium Park. Rooms are no doubt the main feature of the hotel. 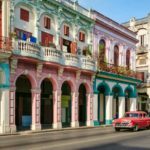 They are all divided into 2 “chambers”: a luxury dressing room, which includes the bathroom, where you get dressed and ready to explore the city, and a so-called sleeping lounge where you can relax, read, play and of course sleep. The 2 chambers are separated by a sliding door, called privacy doors. Rooms are equipped with free wi-fi, convenient minibars, top-design Poliform closets and generous beds with erectable footboard. At Virgin Hotels Chicago, pets are more than welcome: some of the rooms are dog-friendly and even feature dog beds. 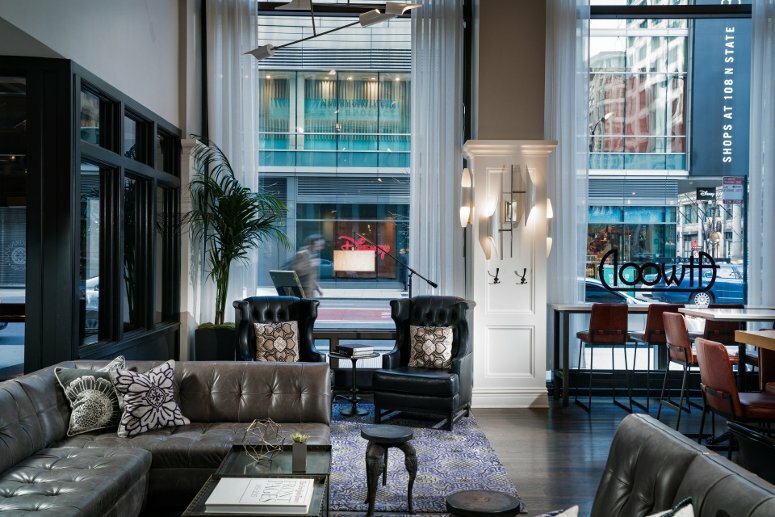 The second floor is the social heart of the Virgin Hotels Chicago: here the Commons Club is a fantastic place that functions as lobby, restaurant, bar and also library and workspace. If you want to enjoy a classic American dinner, book a table at Miss Ricky’s. 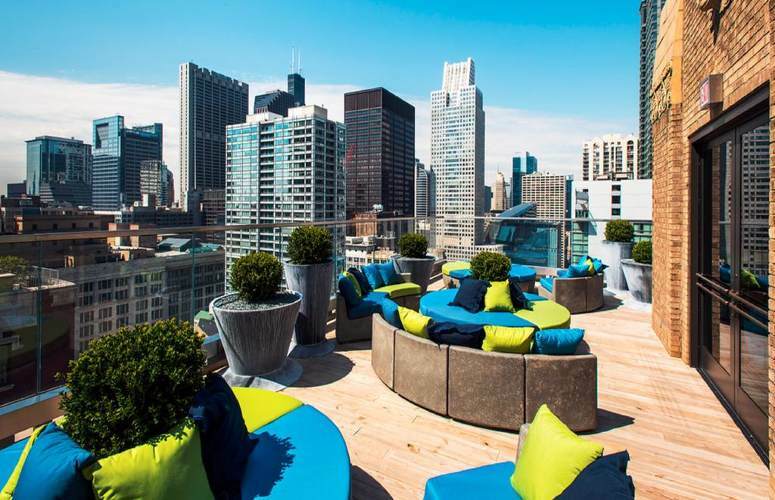 If you want to experience some authentic Chicago nightlife, head to Cerise, the hotel’s rooftop bar. Concerts, live DJs and other performances are held at the Upstairs club. If you prefer the privacy of your room, you can get your food delivered directly there with no delivery charge. Two Zero Three is the coffee bar located on the ground floor that turns into a lovely wine bar at night. For those who want to keep fit while on trip, the hotel provides a rooftop gym and fitness center that stays open 24 hours. 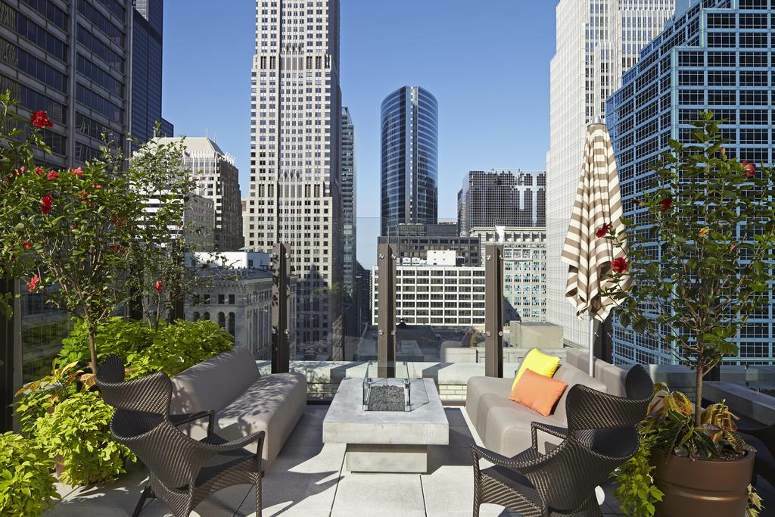 Silversmith Hotel in downtown Chicago is the ultimate destination for those looking for contemporary luxury. 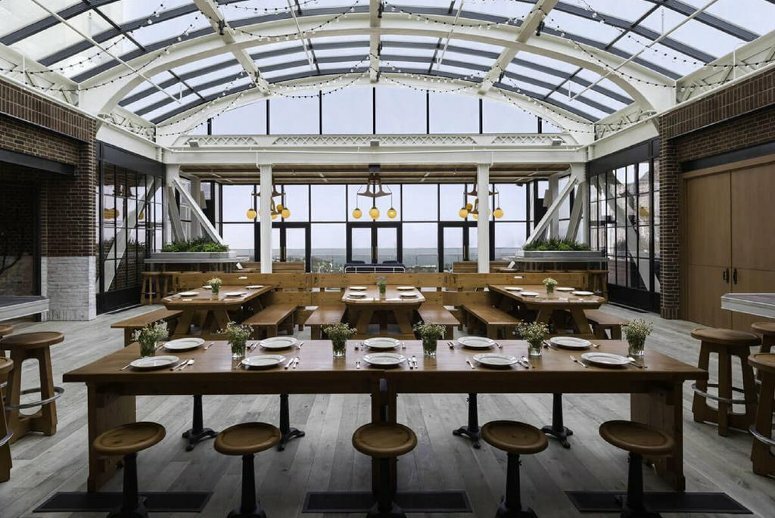 Located in the Jewelers Row District, right in the heart of Chicago Loop, Silversmith Hotel is set in an 1897 building, originally built to house silver and jewelry craftsmen, just one block from the Millennium Park (only 10 minutes’ walking). Renovated in 2008, the hotel is a great option to explore Chicago as it sits just steps from the city’s main shopping, dining and nightlife attractions, including museums, like the Art Institute. All rooms at Silversmith Hotel feature high ceilings, sumptuous beds, spacious marble bathrooms, free Wi-Fi, mini fridges, in-room safes for personal items and flat screen TVs, besides complimentary tea and coffee makers. The hotel provides a brand-new restaurant and lounge, Adamus, offering guests a unique opportunity to enjoy original handcrafted cocktails and innovative cuisine in a vibrant ambience. If you want to keep fit and stay active while there, you can enjoy the onsite fitness center. You can also host an intimate event, e.g. wedding receptions, or business meeting, e.g. training events, in the hotel’s modern business center. 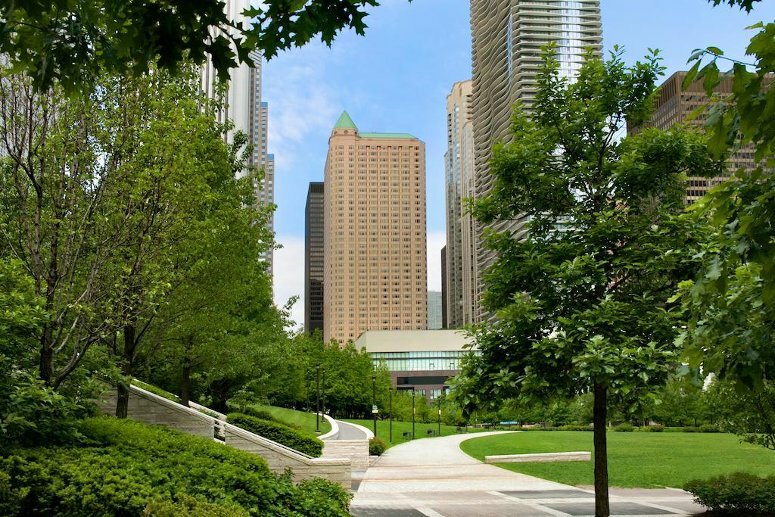 No doubt, Fairmont Chicago Millennium Park is one of the most popular hotels in the Loop area: it is only one block north of Millennium Park (6-minute on foot) and just a short walk to any attractions in the downtown area, such as Lake Michigan, the Art Institute and Navy Pier. Rooms at Fairmont Chicago Millennium Park are spacious with large marble bathrooms and some of them offer amazing views of Millennium Park. There are also some hypoallergenic guestrooms for allergy sufferers. Breakfast is served in the Millennium Room: different breakfast menus are available. There is also a lobby bar where you can enjoy innovative cocktails and top-quality wines paired with small dishes. Columbus Tap is the hotel’s restaurant open for lunch and dinner, basically a gastropub that uses lots of local and seasonal ingredients to create their menus. On request, they can also prepare a picnic basket you can take with you while exploring the city. In-room dining is an option you must take into consideration. Work out at the hotel’s Fitness Studio or relax and enjoy a full body massage at mySpa. Wi-fi is free in the lobby and in the spa area, but you have to pay a daily fee if you want to enjoy it in your room. If you have a car, you can use the hotel’s pricey parking. If you haven’t found the right hotel for you amid the 6 listed above, you can take a look at our complete selection of hotels in Chicago: over 300 properties with different features to choose from. You can also use the search form on this page. If the proximity to Millennium Park is primary for you, we recommed you to filter the results by selecting the Loop area.